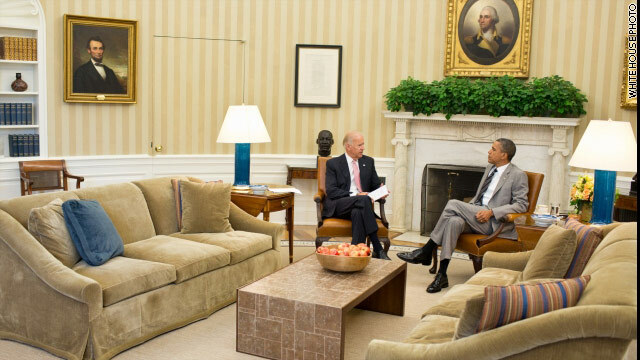 FILE//WHITE HOUSE PHOTO// President Obama and VIce President Joe Biden recently meet in the Oval Office. They will meet again this morning and spend the day in meetings together. President Obama, fresh off a three day bus tour through Iowa, has a low-key day planned at the White House with official meetings, all of which are closed. But the campaign, of course, continues. Yesterday, President and Mrs. Obama sat down for interviews with Entertainment Tonight and People Magazine and what was probably meant as more-featury interview, ended up making news with his comments of support Vice President Joe Biden and the divisiveness of the campaign. Perhaps in a subtle way of support, President Obama and Vice President Biden spend most of the day together in behind-the-scenes, closed-door meetings at the White House on Thursday. They'll get the daily briefing together and then have separate meetings with Secretary Clinton (presumably to get a briefing on her recent trip to Africa) and Secretary Geithner. They'll also have their weekly lunch together. The only time we’ll be able to get any more of a White House reaction is when Jay Carney briefs reporters at 11:30a for the daily White House briefing.